As I am currently looking for a job, I recently started working on personal projects as a way to keep myself busy, to practice, build up my portfolio and most importantly, have fun! Around the same time, I was playing an awesome game called Darkest Dungeon, and I was blown away by the art style. The game is in 2D so I thought I would challenge myself by transforming the 2D style into a full 3D asset. I first started with some of the characters (that you can check on my sketchfab account), like the crusader, quickly followed by another one, the Plague Doctor. Then I decided to do a final character from Darkest Dungeon, and I chose to work on one of the game’s many bosses the Drowned Crew! As the concept was already established, I quickly started breaking it down to determine how many assets there were and thus making it easier to work on. Sweet! Three characters to model! I decided to start with the pirate at the bottom. First I made a basic shape in Zbrush that I sculpted in an A pose, so I could easily rig it later on. As I wanted the final result to be stylish, I did not waste too much time on the high-poly, since all the details would be done in the texture itself and when I was done with Zbrush, I moved onto the retopo and the UV mapping. Once I was done with the first pirate, I moved on to the one with the bottle (that I like to call RumPirate) and use the same pipeline to create a Hi poly in zbrush, then a retopo in 3D-Coat. Finally, I made the captain. This one took more time because he had more assets to model (the cloak, the hat, the beard etc.) but the pipeline was the same. When I was done laying out the UV of the pirates (each one got his own UV Map) I exported them in a FBX format so I could start texturing them. For this project and the previous one, I used Substance Painter for the texturing because I found it very easy to use and the results are quite good. In addition to that, I wanted a handpainted style paired with some PBR techniques so Painter seemed like a good choice. I first started by importing my pirates into Substance, alongside an ID map I created in Maya, so I can work easily on the different parts/materials of the characters. First of all I create a basic color underneath everything, which will be the color of the material. After that, I apply a smart material on it, for example a cloth material so I can get additional details. The following step is to paint the shadows. For me, this is the most important part because these shadows create the Darkest Dungeon style and personality. First I painted the large shadowy areas, then I did all the little details. 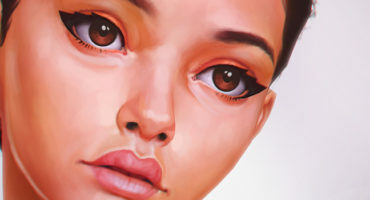 When I was done with the shadows, I added an additional layer of highlights and details on the skin, as well as painting the eyes and the mouth in white. Later, this white texture would be used as an emissive to give these parts a glowing aspect. The same technique was used for the captain and the rumpirate. For the captain’s beard and hair, it was done later on in Photoshop. When I was done texturing, I exported the albedo, roughness and metallic textures and I imported my pirates in Maya. Now that my textures were done, I moved on the rigging and I created a very basic rig composed of the necessary bones so I could pose my models. The same skeleton was used for the three pirates as they were not very anatomically different. The skinning however was done three different times to match the geometries and to include the different assets. Now that my pirates were rigged, it was time to create the basic scene and to pose the characters as in the reference concept. But before posing them, I had to create a placeholder for the other elements of the scene, and the most important one was the shipwreck, which I modeled directly in Maya. After I was done with the shipwreck and its UV Mapping, I placed the pirates in the scene and posed them like in the concept. To ensure that the hands and arms were in the correct positions, I created placeholders of the differents accessories that the crew was holding: the captain’s bell, the bottles and the spear. But as you can see, the pirates are floating and I had to recreate the shipwrecks shadowy interior. So I just created a black plane that I tweaked in such manner that it hides some key parts of the characters, as well as the background, just like in the concept. I was happy with the result, and it was now time to move on the next important task: Modeling the chains. As a matter of fact, the chains modeling was the easiest part. I just created a basic chain mesh that I imported in Zbrush. Then, I exported the pirates with the shipwreck so I can place the chains according to the concept. I used ZBrush’s curve mode to draw the chains on the ship and the crew. The trickiest part was to do the UV and to export them without having a big number of UV map. 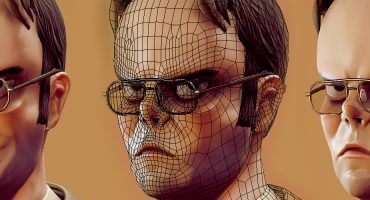 So I unwrapped one chain link in Zbrush then copied and pasted the UV to all the other links, resulting in all their UV overlapping when I exported them. So now, all the important (or critical) elements are in the scene. But there’s still work to do even if the hardest part was now over. So for the next step, I created all the accessories that the crew is holding. In addition to that, I started creating some of the assets composing the final scene, like the barrels and the ropes on the shipwreck. These were easy pieces, so I modeled them in Maya and as usual textured them in Substance Painter with the same techniques. I then added the driftwood around the shipwreck to match the concept. Finally, I made the texture of the base and added an edge, thus finishing the scene. Awesoooome! Now that everything’s done, let’s head to Sketchfab! The reasons why I chose to use Sketchfab to display my work are pretty simple. The rendering is very nice, it’s very user friendly and it allows its users to share their work so that other people can see it. So I imported the 3D model on sketchfab and assigned the different textures. I was talking previously how I wanted to use PBR with handpainted texture and this is where the magic happens. I used and albedo, a roughness and a metallic texture for each one of the assets. In addition to that, I created an emissive texture so the eyes and mouth of the crew could glow. And basically that’s it! 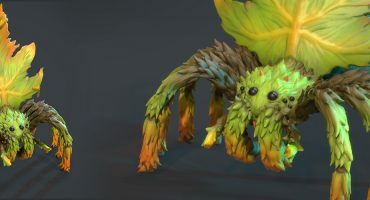 Thanks for reading and I would like to thank Bart and the Sketchfab team for giving me the opportunity to talk a little about my work! If you like my work or if you just want to have a friendly chat, you can always follow me on Sketchfab and check my other works! Otherwise, feel free to follow me on Twitter or to add me on LinkedIn. You can also check my ArtStation page for more. Darkest Dungeon really has an amazing art style and you did a great job translating it into 3D! love this! And I actually like it even more in shadeless, mostly because of how you build the models. Great job! Darkest Dungeon’s art style is something I would never have expected to work in 3D but you pulled it off really well! fascinating modelling technique.. love looking at the mesh! It’s a good job, but i actually think that the atractive in the art of Darkest Dungeon is the 2D work. The 3D art ir pretty, but don’t have this stayle like a ink artesanal work to elevate DD to other’s games.